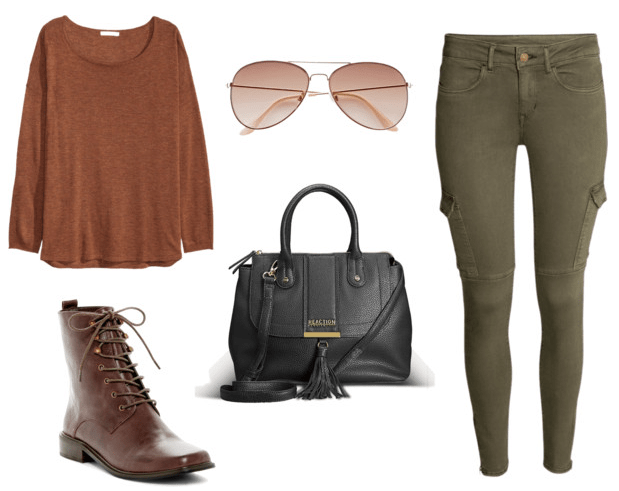 This is a great go-to outfit because it’s comfortable, looks put-together, and it’s not complicated at all. Its officially sweater weather where I live, so I started with a slouchy sweater – wear it off one shoulder like Gigi to channel her vibe. It may be chilly outside but it’s still sunny, so I always keep sunglasses near. Bella’s camo pants inspired the green cargo pants and combat boots, which add edge to this look. Finish with a simple black satchel. As soon as I saw these photos, I felt a wave of inspiration. Bella’s glamorous look paired with Gigi’s sequin/metallic outfit would be so stylish. I love Bella’s jean trench coat and Gigi’s long jacket and bodysuit. This look is all about the warm neutral tones. I started with classic dark blue jeans and a chic trench (both inspired by Bella’s coat) and added a classic bag reminiscent of Gigi’s. The choker was also inspired by Bella’s outfit. An outfit like this is also a great opportunity to try a bodysuit. You don’t have to go pantless like Gigi – you can add a skirt or jeans over it for a super sleek look. Girly meets edgy in this fashion face-off! I was instantly drawn to Gigi’s cool casual outfit in this pairing, although I really like Bella’s sweet and glamorous pink gown. I love to mix girly and edgy pieces together, and these two looks inspired me to do just that. The combination of these girly and edgy looks evolved into this boho-chic outfit. The dress is inspired by both ensembles, specifically the lace up boots from Gigi and the pink dress from Bella with the wavey detail of the neckline. Also, who doesn’t love a leather jacket? That one was obviously from Gigi’s ensemble. The accessories are a mash-up, too: The earrings are a cross between Gigi’s dark outfit and Bella’s sweet one. Long boots with a short dress really look cute and of course the laces are inspired by Gigi’s boots. 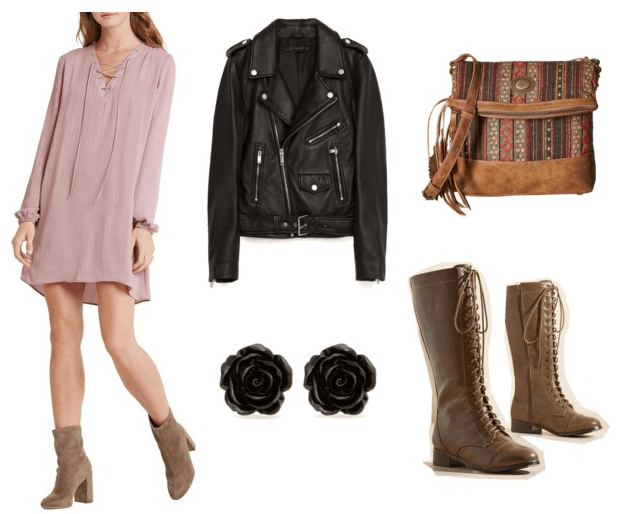 The bag fits with the boots and gives off a boho vibe. Which sister has better style – is it even possible to choose?